This is the main doorway of the Parker House on School Street. The Parker House is the oldest continually functioning hotel in America (1855) and is one of only two hotels on the Freedom Trail. The Parker House is noted for its Parker House rolls and Boston Cream Pie, the official dessert of Massachusetts. 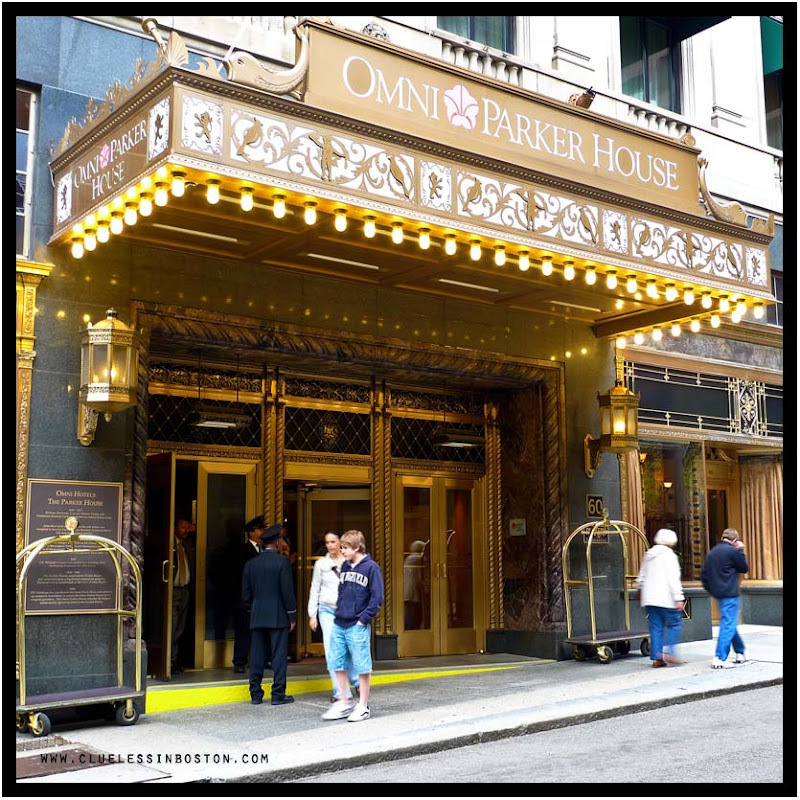 The Parker House is also notable as the first Boston hotel to have hot and cold running water, and an elevator. It is also notable for having Ho Chi Minh work there as a busboy, and Malcom X as a waiter. Notable vistors to the hotel have included English writer Charles Dickens, and the not so notable John Wilkes Boothe. Boothe stayed at the hotel the week before assasinating President Lincoln. Very grand and redolent of those days of the early 20th century. Great image and history. Imagine living in the room beneath JWB. I bet he did a lot of pacing during that week. Nice hotel, but the rooms are small! Good photo, interesting history. My post today is the handsome doors to an old hotel. You are my inspiration. I like the front design. Thanks for the little piece of History. I went by a few times but did not know. Since 1855? !it must be impressive to sleep in a room where such famous people slept or worked before..If only walls could talk! What a beautiful old hotel! It reminds me of the Palmer House in Chicago. Wow, a grand, grand place! What a history! The doorway looks quite oriental. What a distinguished list of employees and visitors this hotel has had. The best part for me though would be the Boston Creme Pie.